The Guardian’s diplomatic editor Julian Borger weighed in on the US debate over the Iran deal in a July 31st article titled ‘The looming August battle for the Iran nuclear deal‘. Borger evidently decided against a comprehensive assessment of US public opinion on the issue which would have invariably had to note that most Americans seem to reject the deal. He instead attempted to evoke sympathy for the putatively marginalized proponents of the agreement, including the President of the United States, and go after the villains who oppose all that is good and decent: Sheldon Adelson, AIPAC and the Israeli right. Sure, if you’re writing for the Guardian and trying to generate sympathy for a deal brokered by a liberal US president, illustrating the mean war hawks on the other side of the political debate by presenting an unflattering photo of an octogenarian Jewish rightwing billionaire is about as good as you can get. But, Borger spends most of his energy on AIPAC. [AIPAC] is an unparalleled example, among the world’s democracies, of one country’s influence on the political system of another. This is a distortion and a smear. AIPAC is an American lobby group which draws its financial and political support from the overwhelming (Jewish and non-Jewish) pro-Israel consensus in the country, as demonstrated in polling over four decades. More importantly, Borger should be reminded that such tropes, concerning undue Israeli influence over the American political system, have been removed previously from Guardian articles by their readers’ editor on the grounds that they were inconsistent with editorial standards. We’re not sure when precisely “Jewish-American lobby” was journalistic shorthand for AIPAC – which is not in fact a Jewish organization. Indeed, if you Google the terms “AIPAC” and “Jewish-American lobby”, you only a little over 3,000 hits and very few relevant examples. Indeed, Borger’s Guardian article comes up 13th! But, this mischaracterization of AIPAC as a putatively Jewish organization serves a purpose. It allows Borger to argue that the organization doesn’t represent the views of Jews – the group of Americans that AIPAC doesn’t in fact represent. …but that is less and less accurate, particularly over the Iranian nuclear deal. Polls suggest a solid majority of American Jews support Obama and his administration’s diplomacy. A survey commissioned by the LA Jewish Journal, found the spread was 48% to 28% in favour of the deal. But Aipac is fervently against it. Naturally, Borger ignores polls with different results. A poll by The Israel Project showed that a plurality of Jews want Congress to reject the deal. Not only does Aipac not represent mainstream American Jewish opinion, it also presents quite a narrow window into Israeli opinion, faithfully echoing the hawkish line of Binyamin Netanyahu’s government. This passage is extraordinarily misleading in that it suggests that opposition to the Iran Deal is emanating from the Israeli right. However, as anyone following the debate would surely know, the overwhelming majority of Israelis – including leaders of the opposition – oppose the deal. According to sources familiar with planning for the trip, it has resisted appeals to include briefings from former members of the Israeli security establishment who are supportive of the deal. Finally, Borger evidently needs to be reminded that the UK Editor’s Code of Practice demands that the media “must distinguish clearly between comment, conjecture and fact”. His latest “analysis” of the Iran Deal doesn’t merely blur the line between fact and opinion, but seems premised on the view that such journalistic standards don’t matter in the slightest. I thought the pic was very flattering actually. Adam, serious question, not playing silly buggers. Do you have any connection with European Forum on Antisemitism ? I agree 100% with this article. The level of deceit and intellectual fraud peddled by the Guardian and their ilk is reprehensible. 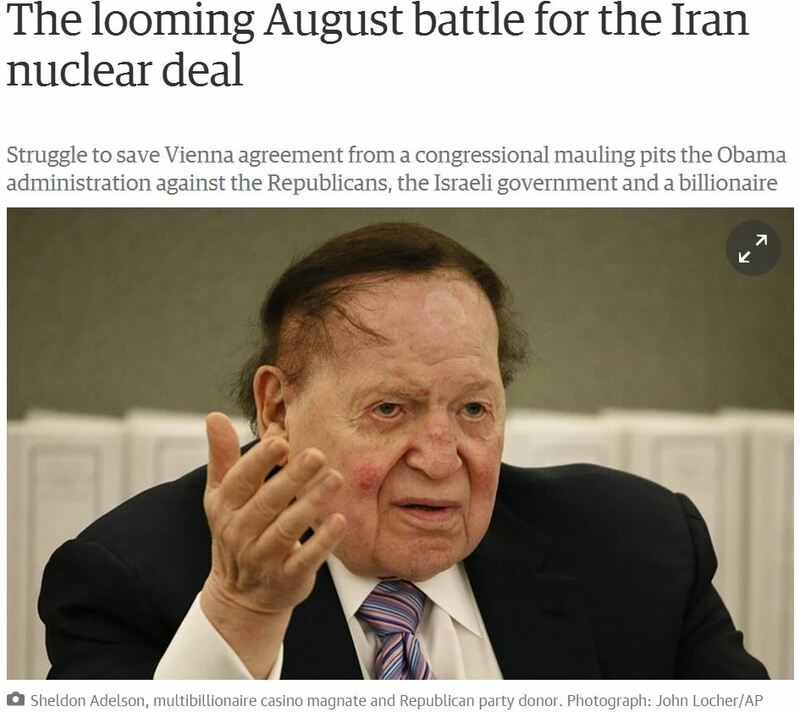 But let’s be honest….is there a photo of Sheldon Adelson that is not “unflattering”?